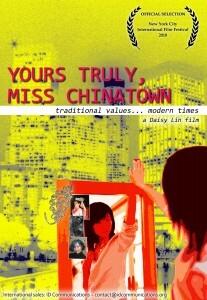 "Yours Truly Miss Chinatown", documentary 52 min. Every year, two dozen women compete for the crown of Miss Los Angeles Chinatown, one of the oldest and best known ethnic pageants in the world. “Yours Truly, Miss Chinatown” uncovers the intimate stories of three young women who vie for the title Miss Los Angeles Chinatown, while struggling to navigate two cultures with conflicting values. The crown is a link to the past, while their lives are a sign of the times. As the spectacle unfolds onstage, so does the drama of their lives – there are no pat beauty pageant answers to real life struggles with love, family, culture, and life as a modern woman. "My father's ideal is for me to marry a Chinese guy...and become a doctor," confesses Miss Los Angeles Chinatown contestant Priscilla Tjio. "Neither of which is coming true." Priscilla's Asian-American angst is captured in the new documentary Yours Truly, Miss Chinatown, which premiered this past May at the Los Angeles Asian Pacific Film Festival, produced and presented by Visual Communications. Miss Chinatown was inspired by filmmaker Daisy Lin Shapiro's drive to get to the bottom of her own Asian-American story. A beauty pageant might seem like a frivolous subject, but to a shrewd filmmaker, it reveals themes running below the surface. As Shapiro tells us early in her film, "Miss Chinatown" pageants sprung up in the 1950s as a PR move to head off America's less-than-flattering Cold War impressions of the Chinese. But the weight of that job was put on the contestants, who were asked to hit a mysterious note that fell somewhere between the non-threatening traditions of Chinese modesty and the we're-so-modern 1950s American va-va-va-voom. The pageants were campy from the start. But they were also a tremendous source of pride in every Chinese-American enclave in the country, and as Shapiro's film shows, remain a source of pride to this day for the contestants and every member of the Chinese-American Chamber of Commerce backing the events. Shapiro should know. As the daughter of a Chamber of Commerce sponsor, she sat front and center at the LA pageants from the time she was a tot-which, as Shapiro said in her Q&A, left her "conflicted. You want to be true to yourself...but you also want to be a good daughter, you want to be true to your heritage." So it's no surprise that Shapiro (today an Emmy-winning news producer at LA's KNBC) starts out Miss Chinatown in good humor with giddy shots of contestants stifling giggles as stern instructors tell them how to walk, talk, sit and be "appropriate in any situation." But before long, her subjects reveal just how hard it is to keep their balanced wearing those pageant heels. Priscilla struggles for Dad's approval of her mixed-race romance. Her fellow contestant, Celeste, struggles with being mixed-race. Meanwhile, outspoken performance artist Kristina Wong offers up "Fannie," a whisky-swilling, cigar-chomping send-up she calls "Miss Chinatown Runner-Up." As Wong says in the film, "Fannie is who I would have been, had I ever run for the Miss Chinatown pageant." Then the story goes deeper, following its subjects past the pageant crowning to the consequences of real-world choices...with scenes that will bring a tear to your eye. International Sales - ID Communications Inc.
-Every year, two dozen women compete for the crown of Miss Los Angeles Chinatown, one of the oldest and best known ethnic pageants in the world. “Yours Truly, Miss Chinatown” uncovers the intimate stories of three young women who vie for the title Miss Los Angeles Chinatown, while struggling to navigate two cultures with conflicting values.